When the fledgling Beatles went to Hamburg in 1960, they had no idea that their world--and music--was going to change forever. Associating with gangsters and prostitutes and sleeping in appalling conditions behind a cinema screen, the Beatles pounded out beat music in strip clubs and dens of vice like the Indra, the Kaiserkeller, the Top Ten, and the Star-Club. In the process, they changed their way of playing, got arrested and deported, wore black leather, lost their bass player, sacked their drummer, developed a vast repertoire of raucous rock ’n’ roll songs, and fashioned a new hairstyle.The Beatles in Hamburg features interviews with the Beatles’ friends and contemporaries, including photographers Astrid Kirchherr and Jürgen Vollmer, bass player Klaus Voormann, Liverpool artists Gerry Marsden and Kingsize Taylor, singers Tony Sheridan and Roy Young, club managers Horst and Uwe Fascher, and many more. 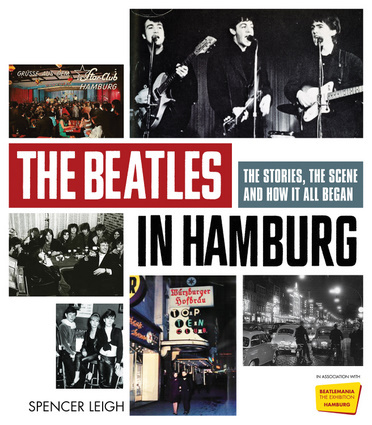 It is packed with close to 150 photographs of the Beatles and the Hamburg scene, some in full color and several never before seen.There have been hundreds of books about the Beatles, but here for the first time is the remarkable, fully illustrated account of the band’s formative years in Hamburg. "As a native Liverpudlian who discovered rock 'n' roll at the same time as the Fabs, Leigh can write about the city and its music scene with an authority other authors lack." —Gillian Gaar,Goldmine, on Twist and Shout! According to Record Collector, Spencer Leigh is “rock’s leading oral historian.” His previous books include Everyday, The Cavern, Tomorrow Never Knows, and The Walrus Was Ringo.